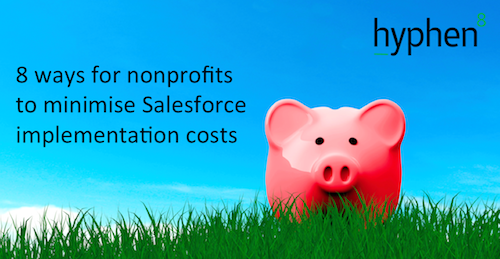 Hyphen8 strives to help nonprofits to minimise Salesforce implementation costs wherever possible. As well as being passionate about our social mission, in the current economic climate, we are all keen to sharpen our pencils. None more so than third sector organisations who need to demonstrate the value of investments to Trustees, donors and other stakeholders, and in some cases to rely on fundraising to pay for the configuration of new technology. In this blog, I explore some of the main ways that non-profit organisations can keep down the cost of their Salesforce implementation when they engage an external partner. The beauty of the Salesforce platform is that it is completely flexible and easy to configure. So you don’t need to ‘go live’ with all of your processes at the same time. You can fast-track the benefits by taking a phased approach as ongoing changes can be developed and tested in a Salesforce Sandbox (development environment). We are great believers in self-sufficiency – using one of my favourite analogies, we like to give you the fishing rod rather than the fish. This not only reduces reliance on external partners but also increases internal ownership and user adoption. Internal super-users can be trained during the implementation to get involved in the configuration of time-consuming elements such as forms and communication templates. With careful initial scoping of requirements, your implementation partner can provide accurate cost estimates for the implementation. However, costs can creep up if too many change requests are raised during the project. It is vital that rigorous project management processes are in place so that there is complete transparency on time/costs incurred. It’s a simple fact (that applies to most things in life) that the more bells and whistles you add, the more it will cost. The Salesforce platform allows you to go beyond standard functionality and develop custom processes, screens, buttons, apps, integrations – the scope is almost unlimited. These are, of course, often necessary but they all take time (and therefore money) to develop. The good news is that it is now more than ever before easier to configure complex requirements using native Salesforce tools. If you do want to keep costs down, we encourage you to stick to standard Salesforce unless it is absolutely necessary. It may sound dramatic but data is the blood that pumps the heart of any database. If users lose trust in the integrity of data in their shiny new system, their interest may wane. Data migration can often be the area that burns a lot of time. Don’t brush this under the carpet, it’s better to invest some internal time to this task to avoid unnecessary costs being incurred. Training is an important part of the introduction of new technology within an organisation and should not simply be a tick box exercise. Depending on your team’s size, diversity of roles and geographical location, training costs can mount. Especially if all sessions are delivered by an external trainer. So we often recommend a ‘train the trainer approach where an internal user can cascade their knowledge. It is very common for organisations to use a wide variety of applications for different purposes and the ongoing costs for these can add up. To save ongoing costs, consider whether Salesforce can be used instead. With a rich array of out of the box features and continually enhancements with 3 new releases each year, chances are the platform offers what you need. There are also thousands of plug in specialist applications available on the Appexchange, Salesforce’s app store, many of which are free or discounted for nonprofits. The process of selecting the right Salesforce partner to implement your solution should not be taking lightly. It should not just a case of comparing day rates – it’s more about evaluating who offers the best value for money. It’s also worth investigating whether you qualify for any pro bono time from Salesforce.org or partners that participate in the Pledge 1% programme.